Global Commercial Seaweed Market Size was estimated over USD 45 billion in 2016 and will exhibit growth by a CAGR of over 8% up to 2024. Seaweeds are naturally-derived products, which has numerous health benefits. They can be differentiated by their color into red, green, and brown. They are cultivated in seas, and oceans, or in places where substantial amount of water is available. Due to the health benefits of seaweeds, their cultivation is increasing across the globe. Rising demand for seaweed products in the food industry, coupled with high production activities of hydrocolloids are anticipated to boost the growth of the market globally over the entire forecast period. Growing awareness of the health benefits of seaweed products primarily in Europe region, coupled with growing demand for seaweed foods in various delicacies are expected to boost the consumption of commercial seaweeds in this region. The commercial seaweed’s demand is increasing over the years because of rise in demand from agars, alginate & carrageenan industry. These processed seaweeds in form of hydrocolloids find various applications such as meat & poultry processing, dairy, canned fish, desserts & jelly, along with in nonfood applications such as textiles, pharma & medical, pet food, textile printing, paper products & other industrial products. These products are gaining importance in Europe and Asia markets over the years because of its rising health benefits. 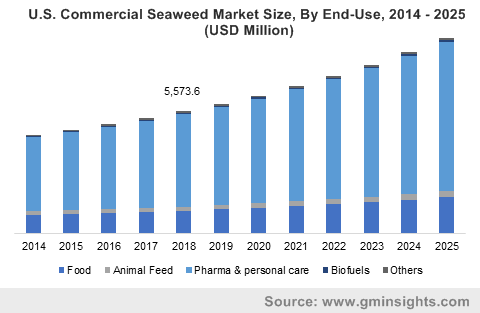 Other applications of commercial seaweeds in end-user industries such as wastewater treatment and the generation of biofuels & cosmetics are further projected to boost the global demand for commercial seaweeds over the coming years. Global market is majorly restrained by the fluctuating prices of wet seaweeds, which are considered as the raw materials to produce seaweed products. The costs of wet seaweeds fluctuate regularly depending upon various factors, such as environment, over-production or shortage, or lack of proper distribution channels in a particular region. The production and distribution cost of wet seaweeds is very less globally. But the price rises exponentially according to applications with lowest price ranging from USD 1 per kilogram to highest at USD 2,000 to 5,000 per kilogram depending upon manufacturing process. Red seaweeds’ demand is predicted to increase at a higher CAGR, regarding both global market volume and revenue, over the projected period. Rising consumption of red seaweeds such as Dulse, and Nori in some of the countries of Asia Pacific for preparing soups, coupled with increasing applications in pharmaceutical (biological) end-user industry is further anticipated to spur the growth of red commercial seaweed market over the projected period. The demand for brown seaweeds is anticipated to increase at second-highest CAGR, from 2017 to 2024. Rising demand for brown seaweed-derived hydrocolloid, named alginate is expected to boost the brown commercial seaweed market growth over the forecast period. Alginate is majorly used as a gelling & thickening agent in end-users such as food, cosmetics, pharmaceutical along with a significant demand from textile industry. Green commercial seaweeds are predicted to have the least market share of the global commercial seaweed market. The demand for green commercial seaweeds is expected to grow at a CAGR similar to brown seaweeds, as they find significant applications in end-users such as food additives and direct consumption. The demand for green commercial seaweeds for direct consumption had the highest share of global market in 2016 and will increase till end of the projected period. Commercial seaweeds in powder form is expected gain a higher acceptance over liquid seaweed in the global market. Powder seaweeds have end-use applications such as such as direct food, textile, food additives, pharma & medical, and others, thereby witnessing a growth rate of over 8% in the projected period. Commercial liquid seaweeds are expected to grow at a moderate CAGR, due to their limited applications in agriculture end-user industry, for the fertilizer spray production in the global commercial seaweed market. The demand for seaweeds for food additives accounted for a significant share in global commercial seaweed market, followed by direct food consumption, and textile end-users throughout the forecast period. The growing demand for seaweed-derived hydrocolloids in food additives, as gelling, thickening, and stabilizing agents are anticipated to drive the global commercial seaweed market over the forecast period. Seaweeds are directly consumed as food in countries such as Japan, South Korea, and China, thereby increasing the product demand in the Asia Pacific region. The per capita consumption of seaweeds in Japan is about 4 kg, while that in China it is 2-2.5 kg. Seaweed-based animal feed improves the health of livestock, by increasing fertility, and milk production. Many companies are focusing on developing seaweeds as animal feed, and this might boost the product demand to produce animal feed till 2024. Asia Pacific market has the significant share of over 75% in 2016 and will grow at a brisk CAGR over the entire forecast period. This is due to the increasing production activities of carrageenan & alginates especially in India & China, coupled with rising demand for seaweed products in countries such as China, Japan, and South Korea. The commercial seaweeds demand for direct consumption as food is further predicted to enhance the growth of Asia Pacific commercial seaweed market. Europe commercial seaweed market is anticipated to grow at second highest CAGR till 2024, due to the rising consumption of seaweeds in food additives along with growing awareness about benefits of seaweed as food. The demand for seaweeds from end-users such as food additives, and textiles are predicted to increase in the North America commercial seaweed market. 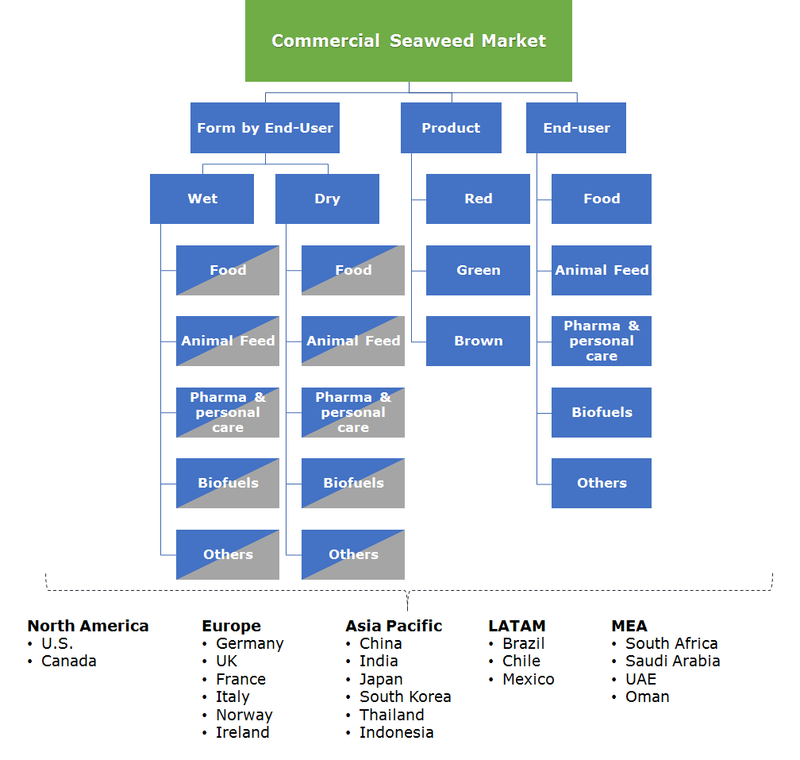 The key players in the global commercial seaweed market include CP Kelco, Seasol International, Chase Organics GB Ltd., Indigrow Ltd., Acadian Seaplants Ltd., Yan Cheng Hairui Food Food Co., Ltd., Algea, Pacific Harvest, Mara Seaweed, Aquatic Chemicals, and others. The primary participants in this market invest highly in extensive R&D activities to improve their product portfolio and strengthen their positions in the current market. Seaweeds can convert into bio-crude, which further can be refined to bio-fuels. The use of fuels derived from seaweeds, which can consume and release CO2, which are highly-neutral, and are advantageous to the environment. Moreover, many processing techniques have been developed over the past few years for extracting biofuels from wet seaweeds. Many R&D activities are in progress to develop this technology, which will be a significant energy source in the coming years.